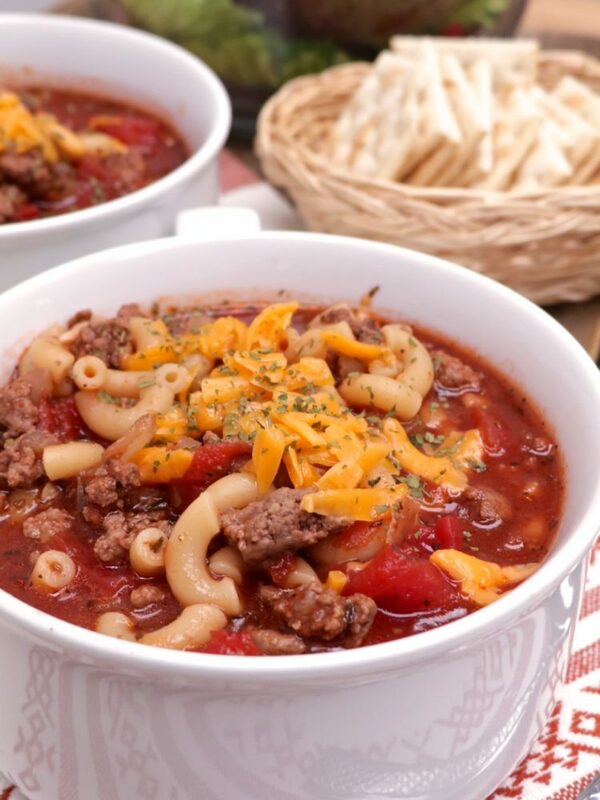 "Hearty beef, seasoned tomatoes, spices, and macaroni come together for this old-fashioned classic, beef and macaroni soup!" 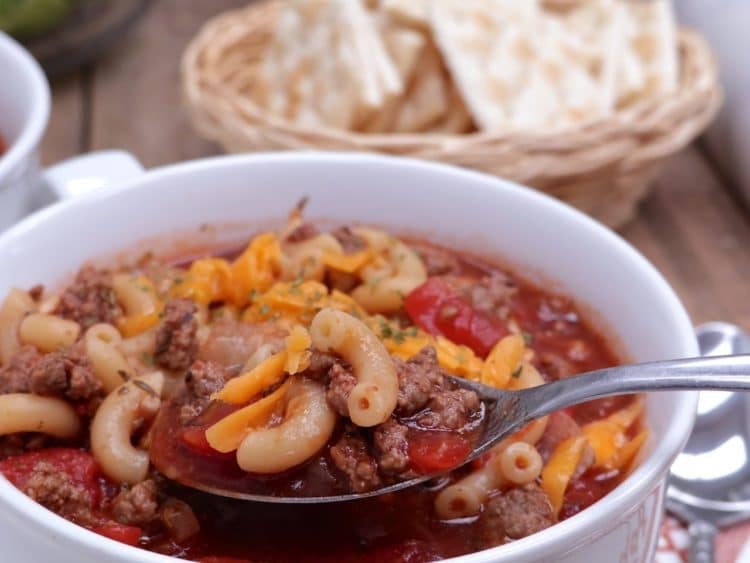 Watch me make this old-fashioned beef & macaroni soup from start to finish! 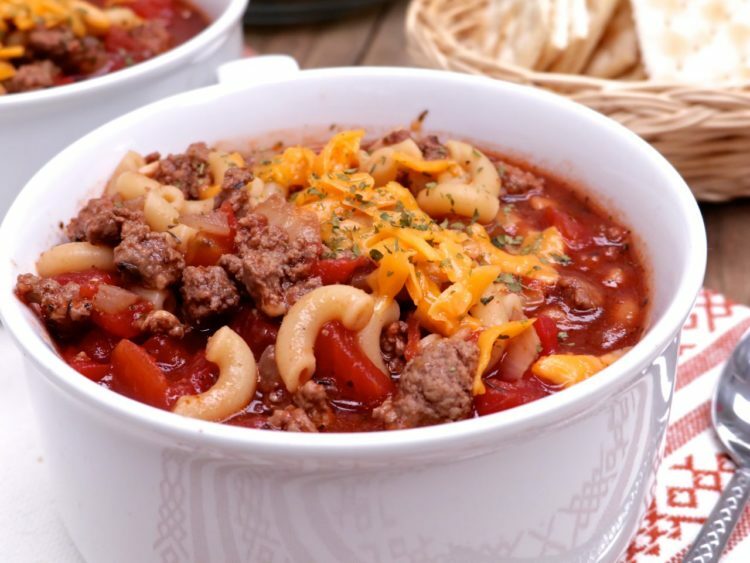 It’s such a simple soup that consists of nothing but beef, tomatoes, macaroni, broth, and spices. Yet it is as hearty and sticks to the ribs like a boss! We grew up calling it Poor Man’s Soup. Some folks know it by Cowboy Soup, Goulash or Beef & tomato soup. Call it what you wanna, but make it! Because it’s super easy, very kid friendly and downright delicious. It’s the perfect rainy or snowy day meal because it seriously warms you up! When I make this beef and macaroni soup I prefer to cook the macaroni in a separate pot and then add it to the tomato mixture. This way the macaroni is perfectly cooked! You can def. cook the pasta in the tomato-broth mixture but you’ll have a creamier finished product on your hands. I’m not a fan of the texture when it’s all cooked together. It’s like the noodles absorb too much of the soup and become soggy and the texture of the soup is thick from the creaminess the pasta gives off when it’s cooking. Sooo…not to be bossy but just cook it separately ok. At least for the first time so you can compare. It just tastes much better. 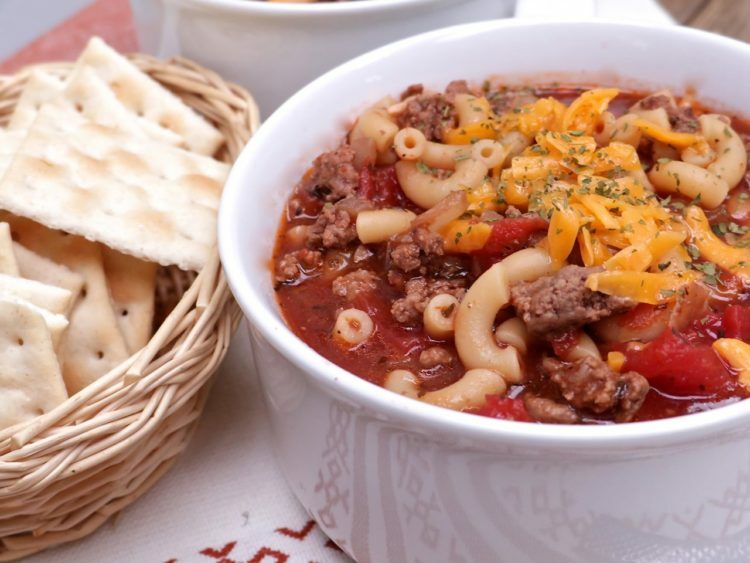 Oh almost forgot, this beef and macaroni soup taste so good with some sweet cornbread or saltine crackers! And the leftovers are heavenly!! Even though I prefer this soup on the simple side, there’s nothing wrong with kicking it up a notch! Add veggies! Got leftover veggies from another meal? Throw them into this soup! We like it with diced potatoes! Add some spice! A lil dash of chili powder, cumin, and a few jalapenos are amazing! Don’t forget the cheese!!! Lots of shredded cheddar cheese is a must!! Pray for a rainy day and then make this soup!! 2 cups dry elbow macaroni, prepared al dente and drained. When beef is cooked, drain off the excess fat. Pour in the beef broth, diced tomatoes, and tomato sauce. Stir in the brown sugar, basil, oregano, thyme, and bay leaf. Add cooked macaroni to the soup. This is delicious! Thanks for posting it! This is such a good recipe, it’s quickly become a staple in our house. So hearty and so very good! I found that it’s not at all necessary to add salt while cooking. All the spices are more than enough! I love your videos and recipes! Please don’t stop! In New England we simplify this – American Chop Suey – Ground beef, macaroni, & tomato sauce. We all grew up on it, throw on cheese & serve with Italian bread, it’s still good old stick to your ribs comfort food! where i live we call this goulash and i haven’t had this in years. I made this 2 nights ago, it was raining and cold so i decided to give this a try and it was wonderful.my husband loved it. thank you for all your great recipes. Made this for dinner tonight. Kids and I love it. I haven’t had this since I was a little girl. My granny made this glad I found this recipe. Thank you Monique.